Say hello to our new host…. Currently a presenter and producer @ the BBC she has interviewed many major stars from the music film and media scenes and is a big part of the BBC switch team. She joins us to take a step outside of the studio and onto the stage and add a sprinkle of stardust to the Remedy Live show! We welcome her with open arms be sure to join us for her debut Remedy Live June 17th!!! Wilson is a London based singer songwriter who’s been quietly doing the rounds on the London circuit for the last couple of years. Now with his commercial music degree under his belt and dues paid, he’s getting ready to make some noise! He is a male soul vocalist unlike any other on the scene. A vocal filled with undeniable quality and sound of soul fused gospel combined with inspired musicianship that helps him stand apart from many of his peers. At the moment he is putting the finishing touches to his EP that should be dropping this summer here’s a couple of snippets of what to expect! Dude is straight ridiculous! 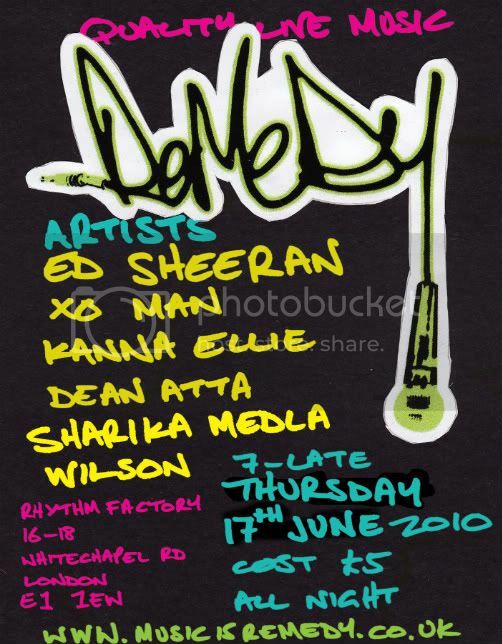 If you want to hear these songs in full catch him live performing alongside the Remedies at Remedy Live June 17th at the Rhythm Factory Whitechapel, as part of an awesome line up of quality live music featuring some of the best up and coming artists around. This tune is something else. One of the dopest UK beats i’ve heard in a long long time…. Tommy Ludgate Recording new music!!! Tommy Ludgate is an artist who’s been around for quite some time now. Released an album Wall of Words tail end of 2008 full of some real nice soul jazz blues! Now working on some new material she invites you to her living room and the recording process! Very nice wish my missus would let me transform my living room into a studio for the day… save a whole heap of money!!! Love the live recording process where everyone plays together you always get a better sound! Looking forward to these recordings will keep you all posted! 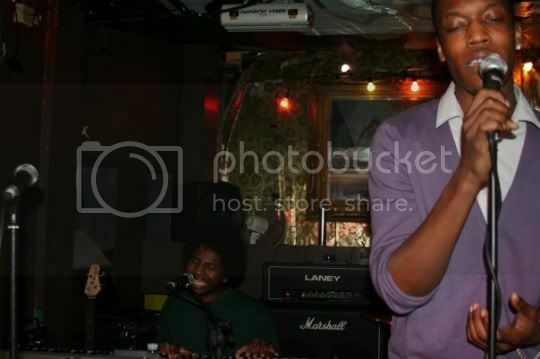 Got a lotta love for this guy right about now grabbed this clip from his blog when he performed @ Plan B! Shakka – Hot Time LIVE @ Plan B (Does Anyone Like Good Music?) from Shakka Philip on Vimeo. Energy in this video is something else man!!! Shakka works the stage ‘aaaarrrrdddd!! And he is backed up by might i say his phenomenal keyboard player…. my girl is having too much fun up there but i guess thats what its all about really… playing music that you love sooo much that it takes control of you and makes you move!!! Man i love live music and playing in a band!!! Wicked track, Wicked band and a wicked artist in the making here!!! Keep your eye on this dude!!! Browsing YouTube i found this footage taken from April’s grand Writers Block night @ Cargo of Kersha Bailey’s performance alongside the Remedies. Such a gorgeous song. And what a performance from Kersha those adlibs at the end were ridiculous!!!! Blessed to have shared the stage and been a part of that performance it was a wonderful moment working with a fantastic artist! WOW! I remember the first time i heard this song over 3 years ago. To this day it still don’t get tired of listening to it. Such a great song! Enrico’s vocals are truly second to none and that is shown in this performance the guy is simply IMENSE! Dude is in a league of his own and you have to get to know. EP is free to download from the link below but it doesn’t do him complete justice you have to catch him Live. Supreme vocalist and a supreme talent! Immense vocal, this lady is serious!!! Not too keen on the song but can’t deny her quality at all! SB is killing it with these A64′s Wicked work! Joleon Davenue Live @ O2 Islington!!! Joleon and his band recently took to the stage @ The O2 Academy Islington where they proceeded to the rock the crowd with there blend of soulful HipHop! Here’s some footage from show!!! As always The JOD is onpoint and the band is getting tighter with the set. Enrico Delves and Chantelle Nandi kill it on the BVs as always and provide plenty of energy to the performance! Look out for details on the next performance!! !